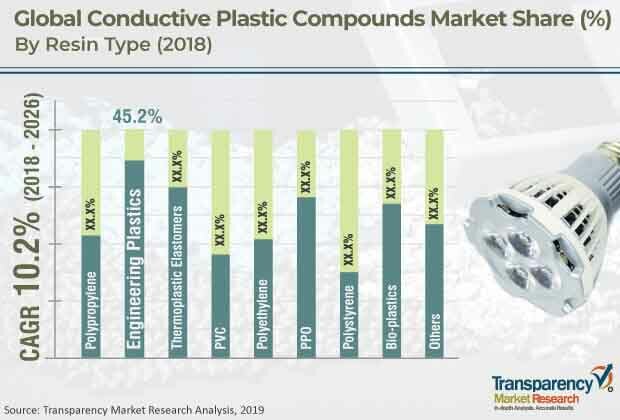 The global conductive plastic compounds market was valued at around US$ 7,500.0 Mn in 2017 and is anticipated to expand at a CAGR of more than 10.0% from 2018 to 2026, according to a new research report published by Transparency Market Research (TMR) titled ‘Conductive Plastic Compounds Market – Global Industry Analysis, Size, Share, Growth, Trends, and Forecast, 2018–2026.’ Rise in demand for conductive plastic compounds in the electrical & electronics industry is driving the global conductive plastic compounds market. Asia Pacific accounted for major share of the global conductive plastic compounds market in 2017. In terms of demand, China held dominant share of the market in the region in 2017. The conductive plastic compounds market in Asia Pacific is expected to expand at a CAGR of around 11.0% during the forecast period. Manufacture of conductive plastic compounds entails extrusion processes, wherein several raw materials pass through a complex process chain. Usage of fillers such as graphene, carbon black, carbon fibers, and carbon nanotubes in conductive plastic compounds plays an important role in each production step to optimally enhance the overall effectiveness of the product. In order to produce high quality and efficient conductive plastic compound products, integrated approaches and research activities are carried out by various compound manufacturers and research institutes. Furthermore, compound manufacturers and plastic converters are focusing on developing products through stable, resource-saving, and energy-efficient processes. Increase in product development programs among compound manufacturers and rise in research and patent activities regarding filler materials among institutes and universities are anticipated to propel the demand for conductive plastic compounds in the near future. Conductive plastic compounds play a vital role in manufacture and assembly of electrical and electronic devices. They offer reliability to applications that require protection from electrostatic discharge, dissipation of static charges, and effective thermal management. Products manufactured from conductive plastic compounds are lightweight, recyclable, and corrosion-resistant parts that protect against damage to dissipation of static charge in electronic applications. Injection molded and extruded conductive plastic compounds offer exceptional electrical properties that span the surface resistivity spectrum from 100 to 1012 ohm/sq. High usage of conductive plastic compounds in the electrical & electronics industry is expected to boost the demand for conductive plastic compounds in the near future. Conductive plastic compounds are also used in electronics processing and packaging, industrial safety, automotive, and aerospace industries. Rise in usage of conductive plastic compounds in several end-use industries due to their exceptional attributes is estimated to drive the global conductive plastic compounds market during the forecast period. Based on region, the global conductive plastic compounds market has been segmented into North America, Europe, Asia Pacific, Latin America, and Middle East & Africa. In terms of revenue, Asia Pacific led the global conductive plastic compounds market in 2017. China is the major manufacturing hub for the electronics industry. The country constituted prominent share of the market in the region in 2017 owing to the high rate of adoption of conductive plastic compounds in electrical & electronics applications. Prominent players are focusing on expanding their production facilities in Asia Pacific to cater to the rising demand for conductive plastic compounds in several end-use industries in the region. The conductive plastic compounds market in North America and Europe is projected to expand at a moderate pace during the forecast period. Advancement in research & development activities among universities and compound manufacturers in North America and Europe is likely to drive the conductive plastic compounds market in these regions. Prominent players operating in the global conductive plastic compounds market are BASF SE, RTP Company, LyondellBasell Industries Holdings B.V., Mexichem Specialty Compounds Inc., SABIC, DowDuPont Inc., Coperion K Tron, Adell Plastics, Inc, Sojitz Corporation, Ravago, Polyvisions Inc, and A.Schulman. The conductive plastic compounds market is moderately fragmented and highly competitive in nature. These companies focus on research and development activities pertaining to electrically and thermally conductive plastic compounds. Ongoing research & development activities in conductive plastic compounds are expected to drive the market in the near future.